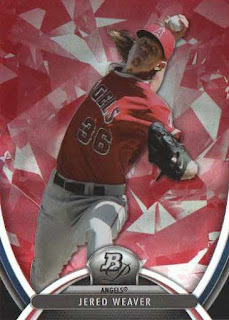 I picked up the Angels themed insert card of a comedian who can probably buy an island or two because he makes a living acting like an imbecil plenty of times over - I'm not completely oblivious about his career as an entertainer, but maybe Ferrell is just one of those 'fan favorites' whose fandom may seem inexplicable at times. For my mini-collections, cards like this one present a problem of sorts - do I save it for my 'awesome action' mini-collection or do I add it to my 'hats off' mini-collection. 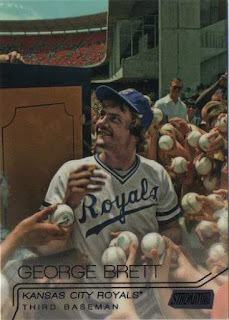 Maybe the common sense solution is to go with the dominant quality on any particular card - in the case of Perez's card, it's about getting a Gatorade shower, so it goes into my 'awesome action' mini-collection. 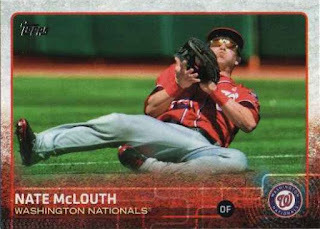 Or maybe I'll just flip a coin to decide where a particular goes and hope to nail down a dupe for the mini-collection that doesn't have it - maybe a card like Werth's would really stand out in my 'hats off' mini-collection because it's not an image of a player lounging around, but a guy about to jump into home plate with the whole team waiting to give him his props. I picked this up for no reason except the image of Bartolo Colon visible on the video screen in the background makes the card a little goofy - it's like the Goodyear Blimp making a cameo. While Doby has been on countless retro cards, he's a baseball pioneer who may not have gotten as much credit for breaking the color barrier - since he was the second person to do it in Major League Baseball after Jackie Robinson in 1947. 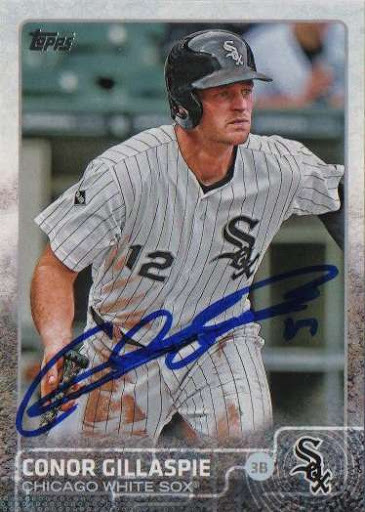 For the Angels, Gillaspie is nothing but a warm body to fill in for the injured David Freese at third base - if Gillaspie does anything with the bat, then perhaps he sticks around as a utility guy who can fill in at a few spots. I never thought I'd drop some serious coin actually a few bucks and change for a junk wax era common of a bespectacled lefthanded relief pitcher in 2015 - however this is the error version of the card where the player in the background maybe in the middle of adjusting his cup. If nothing else, I want to pick up more funny, quirky baseball cards that are highlighted on various blogs / galleries online - to have a mini collection in-hand. I relented to pick my third blaster of 2015 TSC even though I still have not picked up one 2015 Topps Series II blaster - I've thought about building the 300-card base set but I don't want to be huffing and puffing to focus my energy on one trading card product. Because I like the cards, I am going to be hunting down the base cards in bits and pieces [for my mini collections] - I printed out a generic trading card checklist to mark off cards I end up with, so when I'm looking for loose cards, I don't end up with dupes. #16 Robinson Cano - I like the way the image captures the dirt on Cano's batting gloves as he swings away; when cards have images of players hitting a ball, I always wonder if the guy actually got a hit or merely made an out. 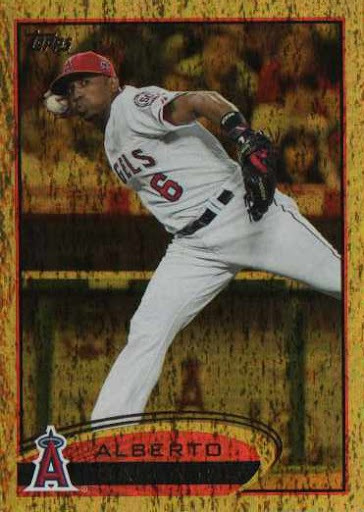 #123 Lenny Harris - he had a fine career, holds the career record for pinch hits and played until he was 40, but why is he in a 2015 trading card product? 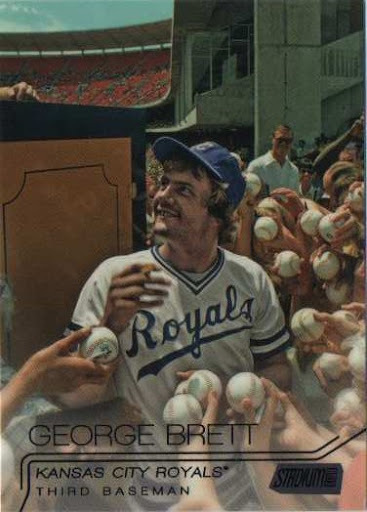 #210 George Brett - Black foil parallel; I've wanted this card since the image used was supposedly the inspiration for 30-year old singer Lorde's Royals song that got popular a few years back; it's a nice bonus that it's a parallel version of the base card. 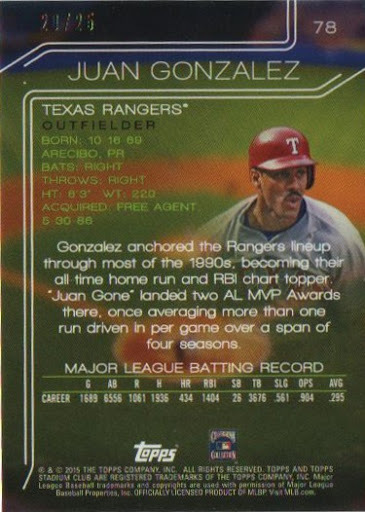 #78 Juan Gonzalez - Foil board parallel serial #'d 20/25; Gonzalez is a 'has been,' with at least couple of bad raps in his MLB career, but 'Igor' was simply legit in his prime and may still have some die-hard collectors. I'll pick up whatever Angels inserts that catch my eye - though I'm not one to maintain wantlists for specific base / insert cards. 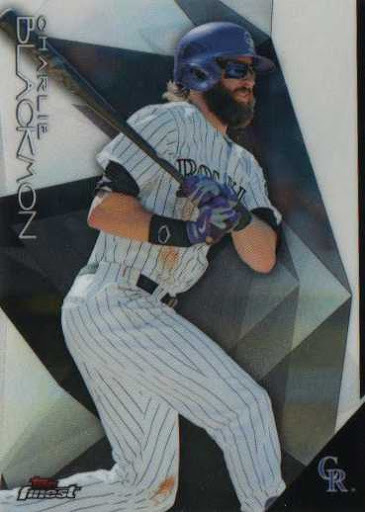 2015 Topps Finest Charlie Blackmon #95 - I like the hitting image of Blackmon wearing shades, with his beard displayed while there is some visible dirt on his uniform. 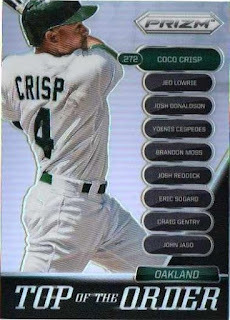 2014 Panini Prizm Coco Crisp #13 - Top of the Order insert; I just picked the card up because it's sort of shiny and not because of the player pictured; while Crisp actually played in 126 games in 2014, it's seems like it's been a long time since he's actually been on a MLB baseball field. 2013 Bowman Draft Picks & Prospects Kendry Flores #BSB-KF - Scout Breakouts insert; the only time I might have had an opportunity to get Flores' autograph in-person was early 2014 and I didn't know who he was and realized he had this card. 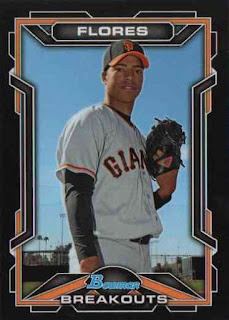 Flores was traded to the Florida Marlins with another minor leaguer for Casey McGehee - who was released by the San Francisco Giants and finds himself back with the Marlins. 2015 Topps Nate McLouth #676 - I don't think I'll ever get through a year's worth of Topps cards to find gems like this, so I'll try to pick up ones that really stand out. 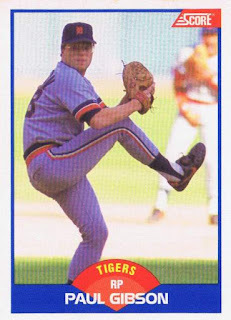 I've been on a self-imposed sabbatical from doing anything with baseball cards, but I picked up this Shoemaker card - while it's not a card of Mike Trout or Albert Pujols, the card itself is supposedly limited to only 17 copies, so it's a nice little find. 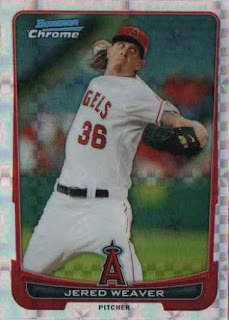 In 2014, Shoemaker was the 27-year old Angels rookie sensation when he won 16 games - even though he's a guy who has battled on the mound, his overall results in 2015 have been uneven at best, so he may find himself bumped into the bullpen once Jered Weaver comes back.